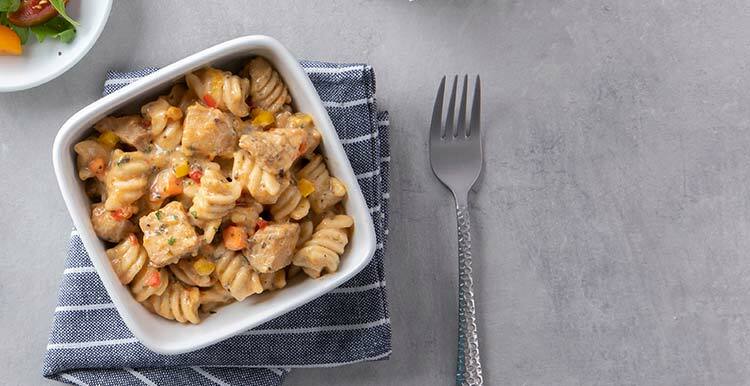 This Tuscan-inspired entrée features tender rotini pasta and chicken with carrots, red and yellow bell peppers, and Romano cheese combined in a creamy sauce for a dish that's sure to hit the spot. Ingredients: WATER, ENRICHED PASTA (DURUM SEMOLINA WHEAT FLOUR, EGG WHITES, NIACIN, FERROUS SULFATE, THIAMINE MONONITRATE, RIBOFLAVIN, FOLIC ACID), COOKED CHICKEN (CHICKEN BREAST WITH RIB MEAT, WATER, ISOLATED SOY PROTEIN, RICE STARCH, SALT, SODIUM PHOSPHATE), CARROTS, HEAVY CREAM, RED BELL PEPPERS, YELLOW BELL PEPPERS, ROMANO CHEESE (MILK, CHEESE CULTURE, SALT, ENZYMES), MODIFIED CORNSTARCH, MALTODEXTRIN, CANOLA OIL, WHEY PROTEIN ISOLATE, YEAST EXTRACT, NATURAL FLAVOR (NATURAL FLAVORING, WATER, CULTURED WHEY, LACTIC ACID, CITRIC ACID), SPICE, GARLIC POWDER, SODIUM PHOSPHATES, ONION POWDER, SEA SALT, APPLE CIDER VINEGAR, SODIUM CITRATE. Nutrients: WATER, ENRICHED PASTA (DURUM SEMOLINA WHEAT FLOUR, EGG WHITES, NIACIN, FERROUS SULFATE, THIAMINE MONONITRATE, RIBOFLAVIN, FOLIC ACID), COOKED CHICKEN (CHICKEN BREAST WITH RIB MEAT, WATER, ISOLATED SOY PROTEIN, RICE STARCH, SALT, SODIUM PHOSPHATE), CARROTS, HEAVY CREAM, RED BELL PEPPERS, YELLOW BELL PEPPERS, ROMANO CHEESE (MILK, CHEESE CULTURE, SALT, ENZYMES), MODIFIED CORNSTARCH, MALTODEXTRIN, CANOLA OIL, WHEY PROTEIN ISOLATE, YEAST EXTRACT, NATURAL FLAVOR (NATURAL FLAVORING, WATER, CULTURED WHEY, LACTIC ACID, CITRIC ACID), SPICE, GARLIC POWDER, SODIUM PHOSPHATES, ONION POWDER, SEA SALT, APPLE CIDER VINEGAR, SODIUM CITRATE.